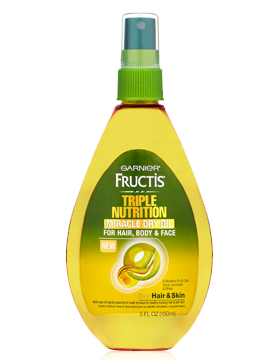 I received Garnier Fructis Triple Nutrition Miracle Dry Oil from Bzzagent to test out. This product is different from other oils because you can use it on your hair, body and face. I love products that multitask. I had some really bad dry patches on my face. Nothing I have previously used helped get rid of them. I figured I would give the dry oil a try. It absorbs quickly into your skin and has a really nice scent. My skin didn't look or feel greasy after applying. I used this twice a day for a few days and could not believe it - the dry patches were gone. I was so impressed with it that I used it on my legs after a shower as well as in my hair. My legs were soft and supple. My hair was silky and smooth. I say if you have dry skin or hair, run, don't walk and purchase this.